Thanks for your interest in our 2019 Ama Dablam Expedition. This is one of the most famous and beautiful peaks in the world, rising above the Dudh Kosi River valley on the way to Everest Base Camp in Nepal. We've now conducted ten successful guided Ama Dablam expeditions and two more successful teams that we supported with logistics and Sherpas. We have had two great seasons in a row after giving the mountain a rest and allowing unstable ice on the Dablam to adjust. Our 2019 Ama Dablam expedition will utilize the same model that has worked so well for IMG over the years on Mt. Everest. This means that we will have a Classic (sherpa guided) and a Hybrid (western guide) team. The Classic program is suitable for experienced climbers who don't require the extra guidance of the Hybrid program. We plan a leisurely trek to Ama Dablam Base Camp, with plenty of time to focus on acclimating and familiarization with the terrain and technical challenges of the climb. We have added more contingency days in the itinerary and crafted a slower and more deliberate schedule for the ascent with more rest and acclimatization days. This will also allow more flexibility. For example, some climbers may decide to go to the summit from Camp 2, while others might opt to spend a night in the higher Camp 2.7 or Camp 3. We want to give everyone the best chance to reach the top, and we know everyone climbs at a different rate. Please contact us if you have further questions or would like to discuss different options. We can put together a package for you that will meet your requirements. How hard is Ama Dablam? How hard is Ama Dablam? You need to have solid rock-climbing and cramponing skills and be able to climb and rappel with a pack on. You'll be jumaring on fixed ropes. There are several short, steep sections of near vertical ice and rock on the spectacular ridge between Camp 1 and Camp 3 that require strength and technique. Up high on Ama Dablam climbers need to be ready for very cold temperatures and wind, so proper equipment is critical. Most importantly, you need good common sense and the ability to learn and adapt. Ama Dablam is usually climbed un-roped, using fixed ropes, so it is common for climbers to move together but at the same time be semi-independent on the mountain between camps. We will provide a walkie-talkie to each climber/sherpa team so they can stay in contact. The IMG staff will be available for consultation in all aspects of the expedition. The best general practice for you is probably to go out and do some longer Grade III or IV rock climbs, preferably ridge climbs with a range of difficulty from short roping/short pitching up to moderate 5th class climbing. If you want to come out to the Northwest and train with IMG guides, we can schedule a climb for you with one of our Ama Dablam veteran guides in the North Cascades over terrain similar to what you would expect on Ama Dablam. IMG is the oldest and most respected high-altitude climbing service in the world and its three principals, Eric Simonson, Phil Ershler, and George Dunn, have led and organized hundreds of expeditions worldwide since 1975. IMG's Himalayan mountaineering programs are organized and directed by Greg Vernovage. IMG has conducted over 60 Himalayan expeditions with a group of guides and Sherpas who are the best in the business. Since 1990, over 600 IMG team members have summited the world's classic 8,000-meter peaks, including Everest, Lhotse, Cho Oyu and Shishapangma. Our goal is to safely help as many team members as possible reach their goal, and we invest in the people and equipment that will make this happen. We value our reputation as the premiere international climbing company, and we only put programs in place that measure up to our own high standards. If you would like to join a world-class team on Ama Dablam, we encourage you to contact us to discuss your goals and qualifications and secure an exciting role for yourself on our expedition! 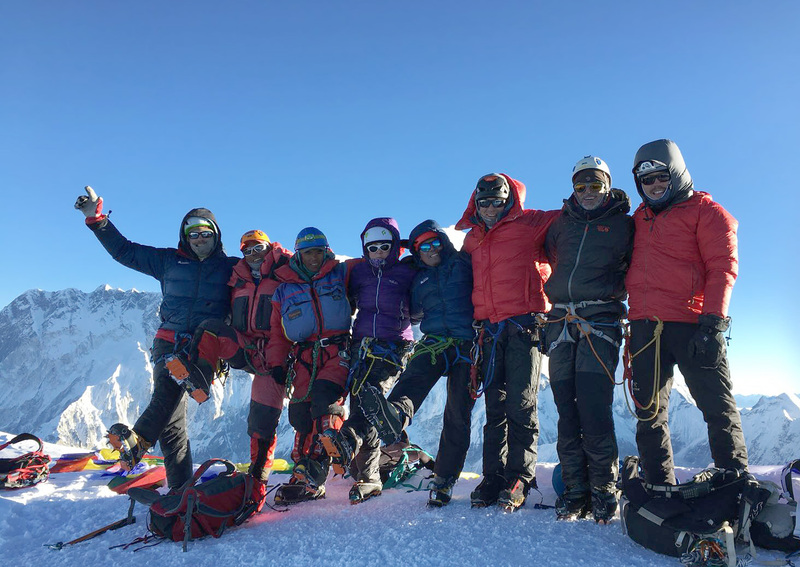 A veteran of dozens of expeditions and an Everest summiter, Ang Jangbu has worked on every IMG Himalayan program since 1991 and is a very popular leader. Ang Jangbu Sherpa and his staff put together one of the very best Sherpa teams for IMG. We are proud to have a group of Sherpas working for us who are among the best paid, best led, best equipped, and best trained in the business. Joining a high-altitude trek or expedition is a serious decision. You should be completely confident in the organization and leadership before you make that decision. Many of you have climbed with us before, and because your experience with us was good, you're considering another climb with us. For those of you who haven't climbed with us before, we strongly encourage you to interview us thoroughly and also talk to our past customers. When you're ready to make the decision, we'll be happy to provide you with a complete list of references. In the meantime, please browse a few comments from past climbers. "Ama Dablam looks like the Matterhorn lifted and transplanted to the Himalaya and dunked in a swarming sea of unearthly, glacier-mantled peaks..."